Our weekly round up industry news from around the web. The National Retail Federation’s Headquarters in Washington, D.C., exemplifies ideal space for mindful eating with an open, flexible kitchen area for collaboration and interaction. Image via Stantec. 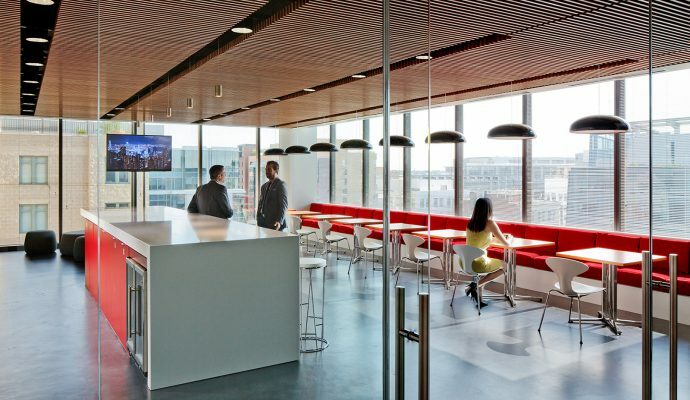 Stantec explores the importance of kitchens in the office as an amenity to help employees feel rejuvenated and focused on their jobs, but more importantly, foster an environment that keeps people connected. Is your office making you sick? Learn more about Sick Building Syndrome from IOL. OnOffice reports that while space for collaboration are important, it’s now time to focus on the individual. Fast Company breaks down a yearlong study that found that most employees would probably benefit from having the option to stand at work.